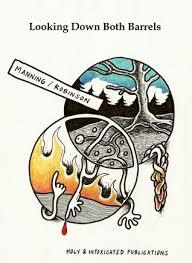 Looking Down Both Barrels is a chapbook which features the poetry of English poets Adrian Manning and John D Robinson. Asked recently about how the project came about Robinson said, "I remember Adrian contacting me with regards to the Poetry Card Series: it was perfect timing as I was just beginning to put together Series 4: Naturally, I was aware of Adrian Manning, not only his poetry but also his Concrete Meat Press and his friendship/ working with and publishing the late brilliant James D Quentin. 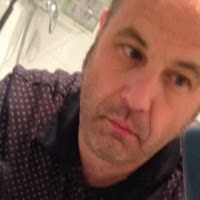 Adrian is a poet and publisher that I have a great deal of respect and admiration for: when I proposed a split chapbook, I really was looking down both barrels and when Adrian accepted, I was blown away." John D Robinson contributes 12 poems which are characteristically first person and confessional narrative in form. Like many of us, Robinson sees poetry as “an obsession, an addiction, a love affair: I spend a great deal of my waking hours thinking of and about and reading poetry.” He was for a long time encouraged to begin publishing by his friend, poet and publisher, Josephine Austin (1934-2014). 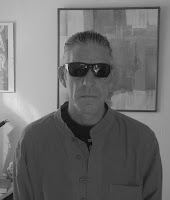 Robinson uses everyday experiences, such as, watching tv, listening to his father weeping, getting his work rejected, relationship problems, killing a fly in a car and the like to tell stories through his poetry. The writing is candid, has a spontaneous feel to it and typically uses direct speech and expletives.